Some love stories may be timeless, but that doesn’t mean that the teller of such tales should have scant regard for the time of the audience. Pankaj Kapur, who, as an actor, has all my respect, spins a never-ending, forever meandering yarn called Mausam that unspools over a period of 10 years, through many seasons, half a dozen cities and gaons, and four historical events before mercifully culminating after three good hours of our patience test. 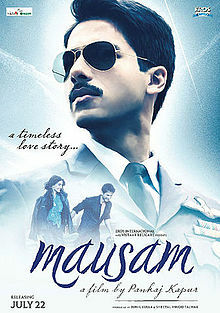 One could be forgiven for thinking that a whole darned mausam passed by outside as one sat cooped up in the theatre through this bum-achingly long saga where ages pass before the muted lovers utter their first expression of affection. Clearly, Mausam is a film belonging to the old world romance, where the lovers spend a good part of their dalliance watching each other from a distance, and when they do meet they communicate through sweet musings doodled on chits of paper. One can’t say how much this film will appeal to the Facebook generation where relationship statuses change overnight and those ‘three special words’ and much more is said and shared without even being fully sure that the person on the other end is indeed the one in the profile pic. So you see a young Punjabi munda Harrinder aka Harry (Shahid Kapoor) cycling through the puddles of his village Mallukot and chewing on sugarcane with his buddies in sarson ke khet before he is hit by the thunderbolt called love when he sees a preternaturally tall but decidedly cute Aayat (Sonam Kapoor), a Muslim girl from Kashmir. Obviously Harry woos and serenades the Kashmiri kudi but their love story is nipped in the bud, thanks to the first historical event, the demolition of the Babri Mosque. Mausam one over!